I was determined to concentrate on the Focus Table, this year featuring a selection of 31 wines by Irish wine personalities who have a keen interest in Australia, including Liam Campbell, Martin Moran, Harriet Tindal, Colm McCan (Ballymaloe) and Gavin Ryan (Black Pig, Kinsale). The figure was supposed to be 24 wines but it did get extended! 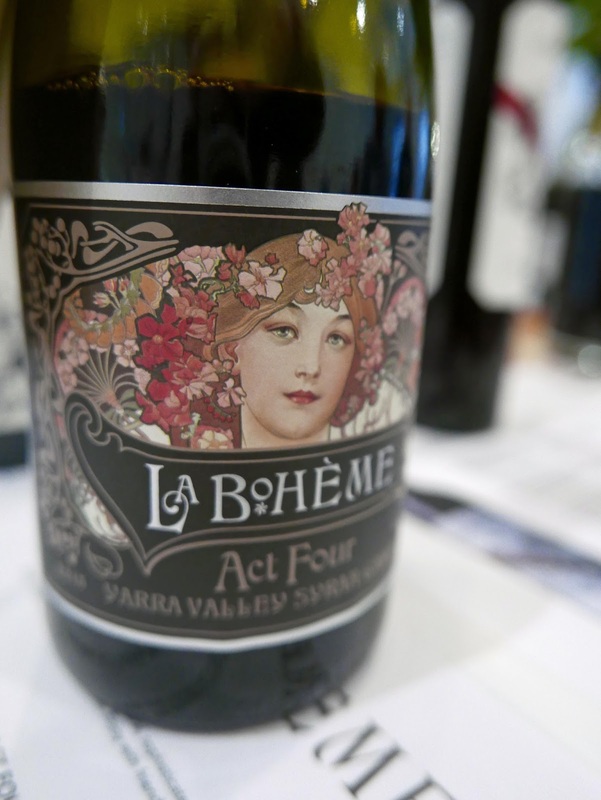 The promise, and it was kept, was that “great classic wines from the likes of Cullen, Clonakilla and Bindi will be on show, plus new-wave artisans like Jauma, Ochota Barrels and Gentle Folk”. So the signs were good as I arrived at the Royal Hibernian Academy and sought out the Focus Table. 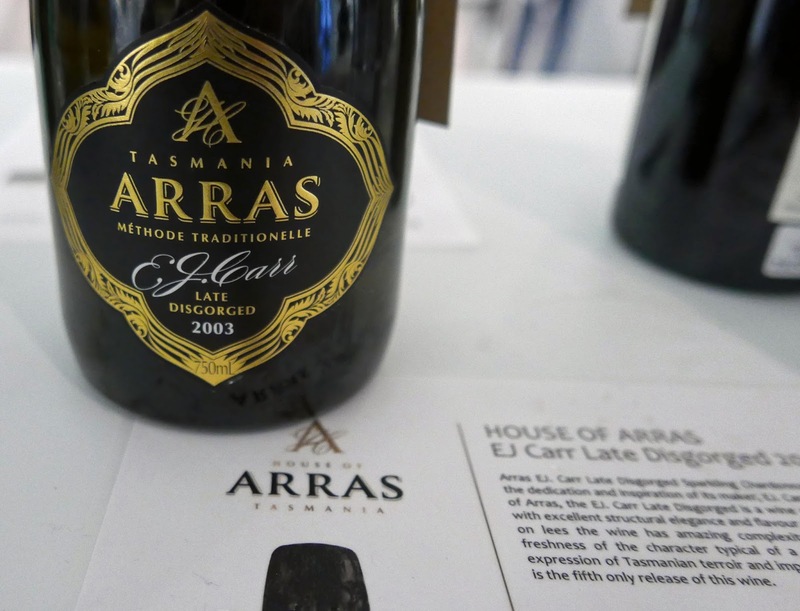 And I made a sparkling start with the House of Arras ‘EJ Carr Late Disgorged’ Tasmania Chardonnay Pinot Noir 2003. Fresh and vibrant, an amazing sparkling wine. Then followed a string of young Rieslings, including the Josef Chromy ‘SGR’ Tasmania Riesling 2016 with an ABV of just 7.5% and a delicious Skillogalee Clare Valley 2015 by Dave Palmer, “mineral, dry and crisp” as noted by Gavin Ryan from Kinsale’s Black Pig who selected it. The Tyrrell’s Vat 1 Hunter Valley Semillon 2011 was superb, “intense and complex, but elegant and refreshing” noted Martin Moran. It was all good around here and the standard was maintained by the Bird in Hand Adelaide Hills Grüner Veltliner, the grapes picked in the cold of the night to retain flavour and freshness. 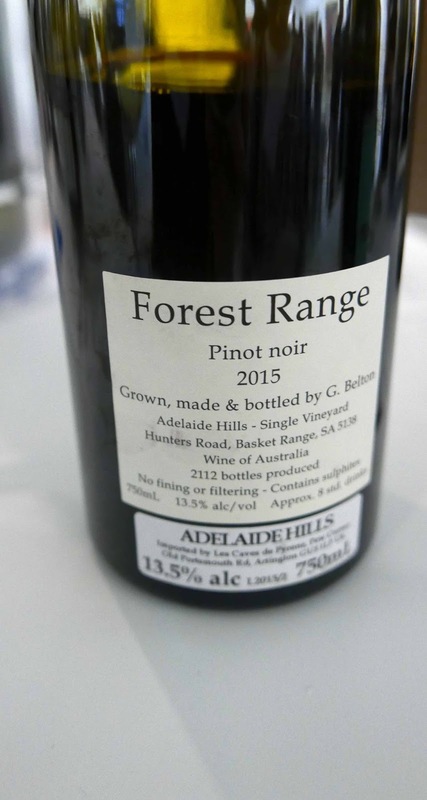 Maximum drinkability and enjoyment is the aim of the producers of the Gentle Folk Forest Range Adelaide Hills Pinot Noir 2015, the first of the reds and the first of Ballymaloe's Colm McCan’s selections for the table. I reckon the producers got it right as did Colm. There were quite a few Syrah and Shiraz at this point, all very good including the Payton and Jones ‘Major Kong - Planet of the Grapes’, Yarra Valley 2015. My favourite though was the blend: De Bortoli ‘La Boheme Act Four’ Yarra Valley Syrah Gamay, imported by Febvre and a Liam Campbell pick. 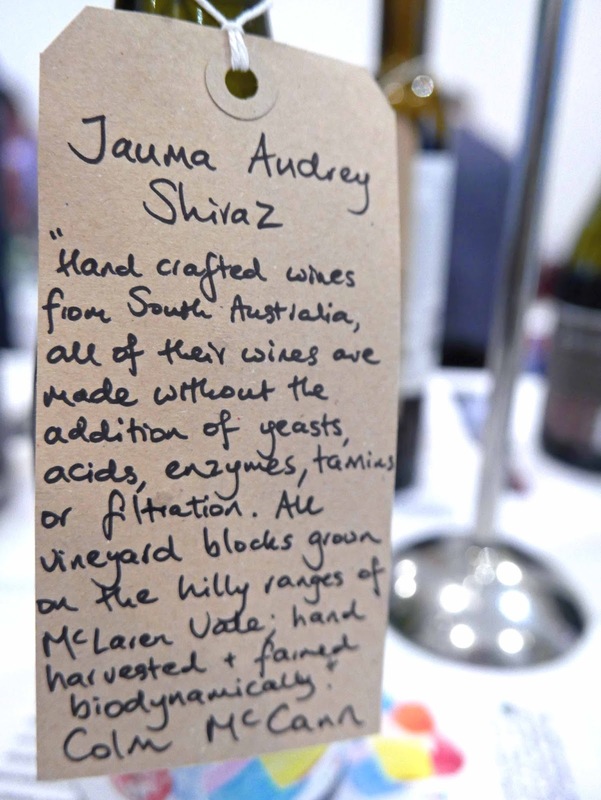 The Colm McCann selection, Jauma ‘Audrey’ McLaren Vale Shiraz 2015, is produced biologically and intrigued with its “cider-y” notes. Some excellent Grenache on the table too including Ochota Barrels ‘The Fugazi Vineyard’ McLaren Vale 2015, the Willunga 100 McLaren Vale 2015, and the Cirillo ‘1850 Ancestor Wine’ Barossa Valley 2011. 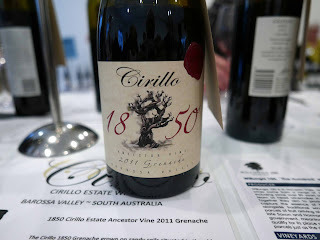 The Cirillo was chosen by Ian Brosnan of Ely and he admitted that, until recently, he had never tasted Grenache of this quality. And quality too, at a very good price, in Kevin O’Brien’s Kangarilla Road Terzetto, a McLaren Vale blend of Sangiovese, Primitivo and Nebbiolo. 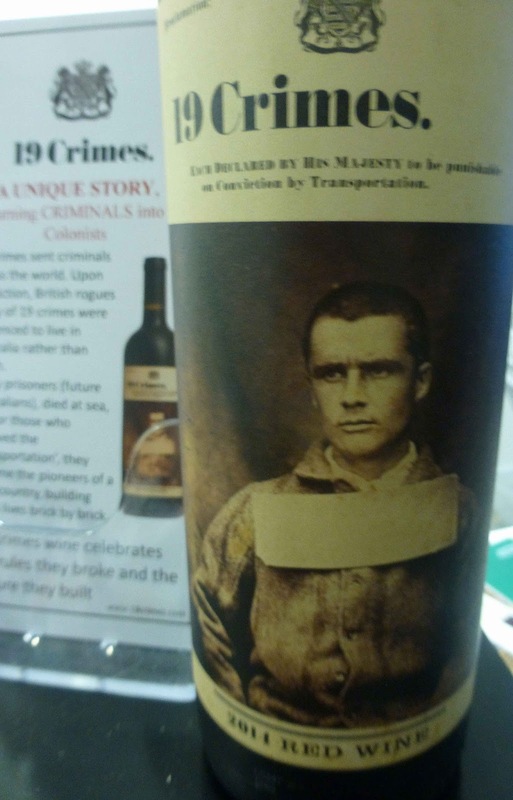 It is a favourite of mine, was chosen by Liam Campbell and is available at O’Brien Wines. Perhaps the best blend of the lot came towards the end: the Cullen ‘Diana Madeline’ Margaret River Cabernet Blend 2014, imported by Liberty Wines and nominated by Gavin Ryan who has fond memories of enjoying it at a full moon harvest party in Margaret River. 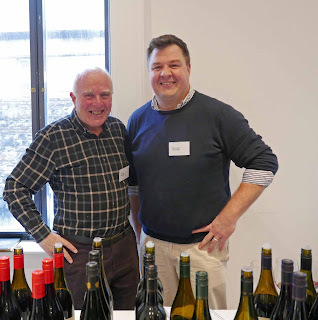 Time then for a chat at the Liberty Wines stand with Garry Gunnigan and new recruit Marcus Gates and a tasting of their sweet wines before heading into the general wine area. Here we soon met up with Jonny Callan of Cabroso Wines who import the Kelly’s Patch range to Ireland and we hope to link up in Cork soon and find out more about the company. Having concentrated on the Focus Table we missed out on many stalls, including McGuigan where they were tasting the impressive Founder’s Series that I enjoyed in Kinsale a few months ago. Hard to go wrong with the Deakin Estate and Katnook Wines that are imported by Findlater (and available in Cork in Bradley's and other outlets). Next time I'm up in North Main Street, I'll be looking at some of the Penfolds that Laura introduced me to at the Findlater’s stand. Both the Bin 2 South Australian Shiraz Mataro (that is what the Australians call Mourvedre) 2012 and the Bin 28 South Australian Shiraz 2011 impressed. Been writing this and wondering how the Australians get to name their wines. Heard a good story from Michael at the Lanchester Wines stand as we sampled the excellent ‘Don’t Tell Gary’, a McPherson Shiraz 2015 from the Strathbogie Ranges. This wine is a labour of love - one the accountants didn't know about. 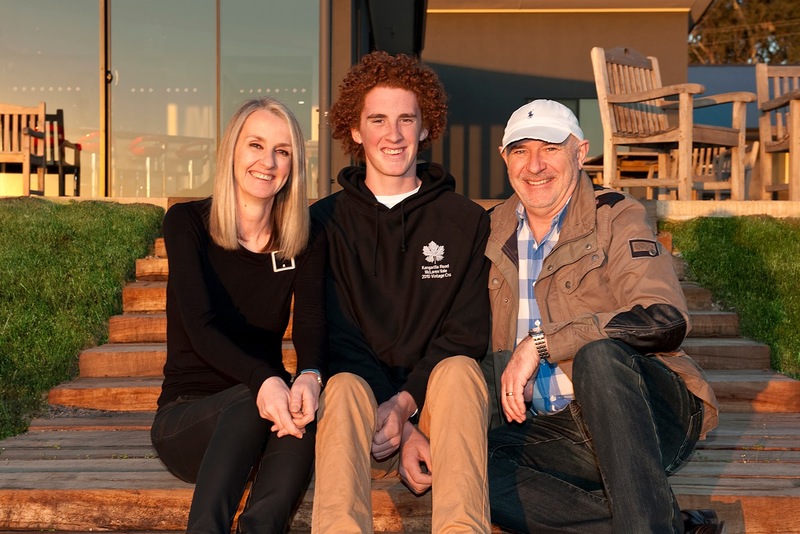 In 2014, winemaker Jo Nash discovered an exceptional parcel of Shiraz from the Grampians which she gently crushed, then tucked away in some ridiculously expensive French oak barrels to age for 12 months. All the while, she was urging her fellow employees: “Don’t tell Gary”. No one did tell Gary, her boss. Now the wine speaks for itself - minimal intervention, purity of fruit, Shiraz at its best and Jo has been given free rein to investigate other possibilities in the vineyard! See also earlier article on great selection of fortified sweet wines at the tasting here. 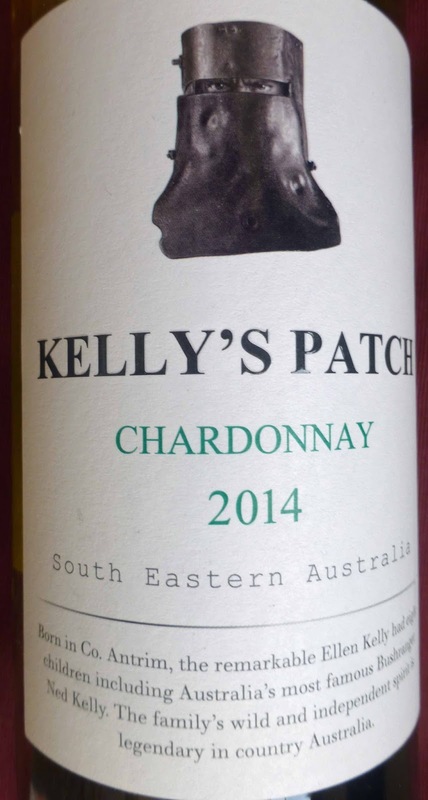 From way down in South-Eastern Australia comes the collection of very drinkable Kelly’s Patch wines. 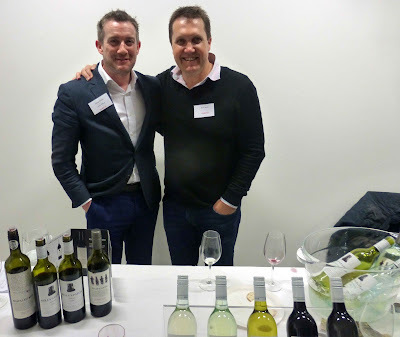 I came across them a year or so ago in Karwig’s and came across the team behind them at the recent Australia Day Tasting in the Royal Hibernian Academy in Dublin where Wine Australia showed over 200 wines to illustrate the diversity of wine in the vast country. Cabroso Wines were showing the Kelly’s range and here we were delighted to meet up with Jonny Callan and Brian Shaw from the Irish end (they are based in Magherafelt, County Derry) and Matt Herde (see his short tasting videos via the links below) from the Australian end in Victoria. Brian himself was just back after no less than four years spent working and studying in the wine industry in Australia and New Zealand. All their wines are single varietal. The whites are Kelly's Patch Sauvignon Blanc, Pinot Grigio and Chardonnay while the reds are Merlot and Shiraz. They also have a pair specially developed for the on licence trade, namely Kelly's Gang Shiraz and Kelly's Gang Sauvignon Blanc which you can watch out for in restaurants. Took the opportunity to taste most of these in Dublin and they are very pleasant wines indeed, all easy drinking and all well priced at €11.99 for the off licence bottles. The Pinot Grigio is beautiful and fresh. The Sauvignon Blanc is fresh and vibrant with good tropical fruits. The Merlot surprised me with its plummy spicy fruit, very concentrated with a lovely soft mouthfeel, a very nice drop indeed. The Kelly’s Patch Shiraz is also very good, warm and hearty, fruit-forward and enjoyable as Matt says here in this short video. We later had the chance to taste two of the wines, including their star, the Kelly’s Last Wish Shiraz, at our leisure and the notes follow. The fruit for this comes from Goulburn Valley where Chardonnay is the leading white grape. The aromas are an inviting mix, mainly fruity but with some floral elements. Colour is a bright medium gold with green tints. Importantly, oak use has been careful and applied to only a portion of the wine. Extended lees contact has enhanced the structure. There is indeed a refreshing balance of fruit and lively acidity and a very good finish to boot. Well made, good value and Highly Recommended. Central Victoria is Shiraz country and the Last Wish, with its abundant succulent flavour and character is an excellent example. The fragrance of plums and the lift of spice are found in the attractive aromas and a palate full of concentrated fruit follows, oak too but really well integrated. With its tremendous fruit and spice, this is a complete wine, one that the winery say will keep for seven years. Not full on but nicely judged, as Hugh Johnson might say. Highly Recommended. Ned Kelly's "mark" on left hand pic. Just in case you haven't guessed it, Kelly's Patch is named after Ned Kelly, an Australian bushranger of Irish descent. He was born in the British colony of Victoria as the third of eight children to an Irish convict from County Tipperary and an Australian mother with Irish parentage. Kelly is one of Australia's greatest folk heroes, according to a government website. “He has been memorialised by painters, writers, musicians and filmmakers alike. More books, songs and websites have been written about Ned Kelly and the Kelly Gang than any other group of Australian historical figures.” Read more here. Briefly, he was born in 1855 and hanged in 1880. His last wish was to be buried in consecrated ground but that didn't take place until 2013 when he was reinterred in Greta Cemetery in Victoria. South-Eastern Australia is a Geographical Indication (GI) covering the entire southeastern third of Australia. This area's western boundary stretches 1250 miles (2000 km) across the Australian continent, from the Pacific coast of Queensland to the Southern Ocean coast in South Australia. This vast viticultural "super zone" effectively encompasses every significant Australian wine region outside Western Australia. Part 2. The Red Wines. Shiraz Stars. Shiraz. Wine Australia photo from 2016 vintage. The diversity of Australian wines wasn't perhaps the most demanding of themes for the recent Australia Day Tasting in Dublin! 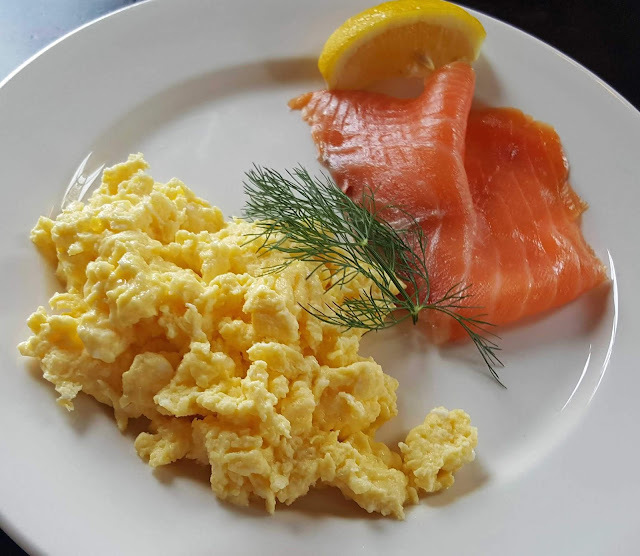 There are some great choices already in Ireland and more coming our way, at all price levels. Australia has over sixty wine regions, so somewhere there is a terroir suitable for virtually every single grape variety and indeed almost all grape varieties are grown there; resulting wines can be single varietal or a blend. 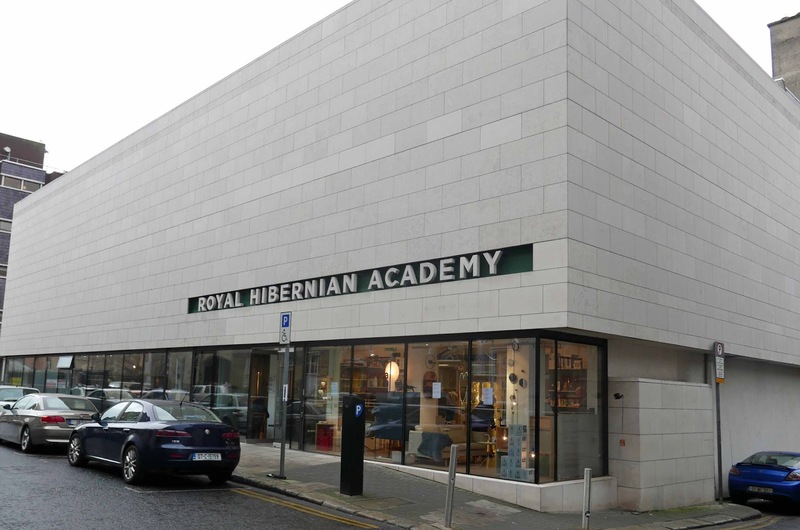 We are moving on now to our second tour of the room in the Royal Hibernian Academy, the red route. All that after a chat with fellow wine scribe Richard Magnier who was enjoying the concentrated excellence available at the Focus Table for Chardonnay and Shiraz. Check Part 1 (the whites) here. Food friendly and vibrant can easily be applied to the Merlot from Kelly’s Patch and shown by Jonny Callan of Cabroso Wines. McGuigan’s too have a Merlot in their Black Label series as have Yellow Tail while Wolf Blass has a Malbec. Penfolds have a Mataro (Mourvedre to you and me). 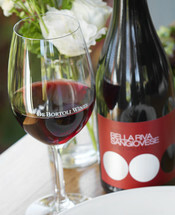 And if you like your Chianti it's entirely possible you'll like the De Bortoli Bella Riva Sangiovese 2013, from the King Valley in Victoria. Not too many Pinot Noirs on show but I did enjoy the De Bortoli Windy Peak 2013 from the Yarra Valley, superb flavour and balance here, even it's their third label. 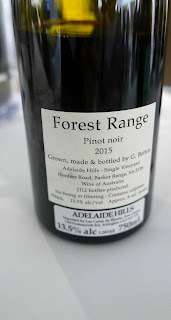 Missed out on tasting one from Tasmania, an ideal area for the grape, but there was Tasmanian fruit (along with fruit from Victoria) in the excellent Hardy’s PRB Pinot Noir 2014. No shortage of red wine blends in the tasting. And one of the best was the Yalumba The Scribbler Cabernet Sauvignon and Shiraz (2012) from the Barossa, so well balanced, very quaffable indeed. All we were short was Jane Ferrari! Didn't quite get the same grá, at first sip, for the Peter Lehmann Clancy's Red (Shiraz, Merlot and Cabernet Sauvignon) - might need a second go! And then, at the Findlaters table, there was 19 Crimes, named after the 19 listed crimes that made you a criminal in these parts and gave you a one way ticket to Australia. The “wine celebrates the rules they broke and the culture they built”. And this intense flavoursome wine is quite a blend with Shiraz (57.1%), Cabernet Sauvignon (19.3%), Grenache (10%) and Merlot (6.4%) included. The Australians can blend a wine as good as any and can also tell the tales. 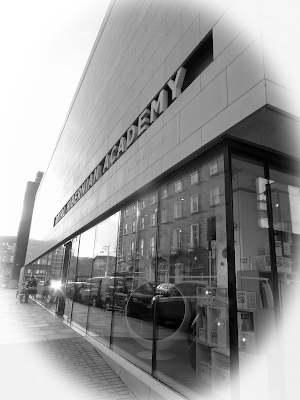 Read about one of the “criminals” here, a Irish poet called John O’Reilly. But tales and marketing can only bring you so far. The quality must be there and it is rarely lacking in Australian Cabernet Sauvignon and Shiraz. Let's start with the Cab Sauv and a lovely easy drinking one, again from the Findlater table, the Gentleman’s Collection 2014 from South Australia. For fifteen euro, this one ticks most of the boxes. At Table 14 (Whelehan Wines), I asked for the Parker Coonawarra Estate Terra Rossa Cabernet 2013 (29.95). CL is a major Cabernet fan and thought she had struck gold. And it is a beauty - great balance structure and fruit. But it would soon be eclipsed(!) by the Parker Coonawarra Estate First Growth 2010 (€85.00). This is produced only in seasons of exceptional fruit quality. It's made from predominantly Cabernet Sauvignon from their Abbey vineyard and some vintages, including this one, contain a small portion of Merlot and/or Petit Verdot. It is perfection. Best Cab Sauv I tasted for the afternoon! 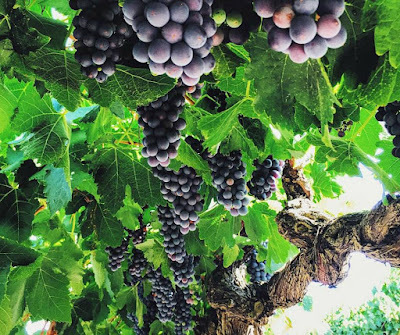 Australia can boast much richer stocks of ancient Shiraz/Syrah vines than France. It was one of the country’s original varieties and many vines there are now well over 100 years old. While Shiraz (42,000 hectares) may well be Australia's signature variety (think Penfolds Grange), the style is ever-changing, from “classic full-bodied” to “delicate interpretations”. “While Barossa may be the jewel in Australia's Shiraz crown”, quite a few other, often cooler, areas are also making their mark. Let's see what I got to taste in Dublin and, remember again, I didn't taste every example. Kelly’s Patch, the vineyard with the Irish connection (not the only one! 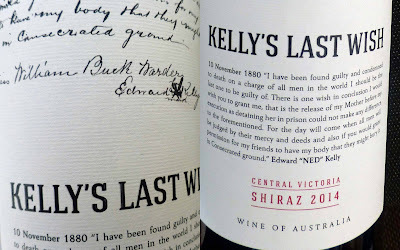 ), had no less than three, headed by the award winning Kelly’s Last Wish 2014 (€19.99), from Central Victoria, really well-made, with fragrant aromas and a palate full of concentrated fruit and spice. 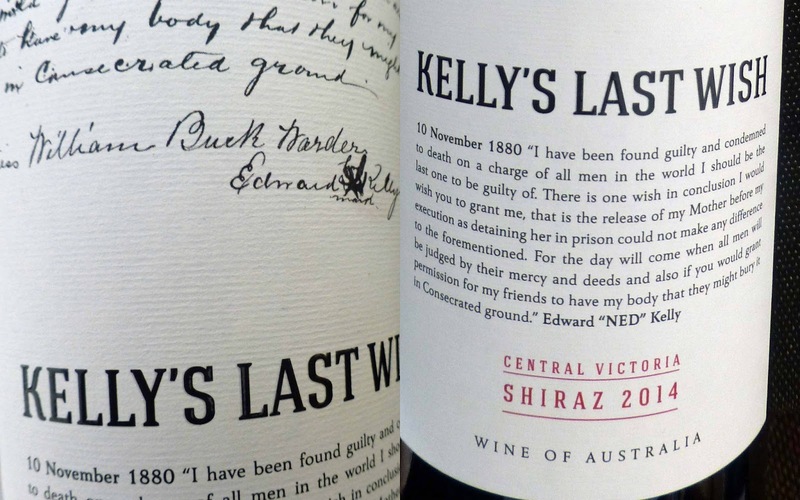 The name comes from a story concerning the outlaw Ned Kelly's final wish, another tale on a bottle. Peter Lehmann is famous for reds and, from a whole stable of Shiraz, my pick was the Futures 2011 (30.00), from the Barossa. Fruit and spice galore and an ABV of 14.5%. Most Australian Shiraz will be up around that, some even above. D'Arenberg’s Dead Arm is their best known Shiraz but, with diversity in mind, I sampled the mid-range The Footbolt 2012 (€22.00) from the McLaren Vale. Another superb example with typical fruit and spice. Hard to go wrong with Shiraz in this room. They just kept getting better. And Findlaters had quite a gem in the Wynns Coonawarra Estate Michael 2012, succulent, well integrated, well made with great length. The Shiraz Star of the Show? That’s what I was thinking until I came to taste the Kangarilla Road The Devil’s Whiskers 2013 from the McLaren Vale. After that, I reckon the Best in Show title will have to be shared with Kevin and Helen O’Brien’s magnificent wine. Kevin was there himself: “It is consistent, ages beautifully. I tasted the 05/06 recently and it is beautiful vibrant, lovely.” This 2013 seems to be heading in the same delicious direction. We have been missing the brilliant Kangarilla Road wines these past few years in Ireland. Kevin, like quite a few other Australian winemakers, came to the Dublin show searching for a distributor. Kangarilla, with so many superb wines in the range and popular in the UK, would be a fantastic addition to any portfolio here. To learn a little more on Shiraz, check out this podcast. Over 200 wines. Phew. To be honest, I didn’t set out to taste every one. And, even if I had managed the feat, that still wouldn't have given the complete picture of the diversity found in Australian wine today. 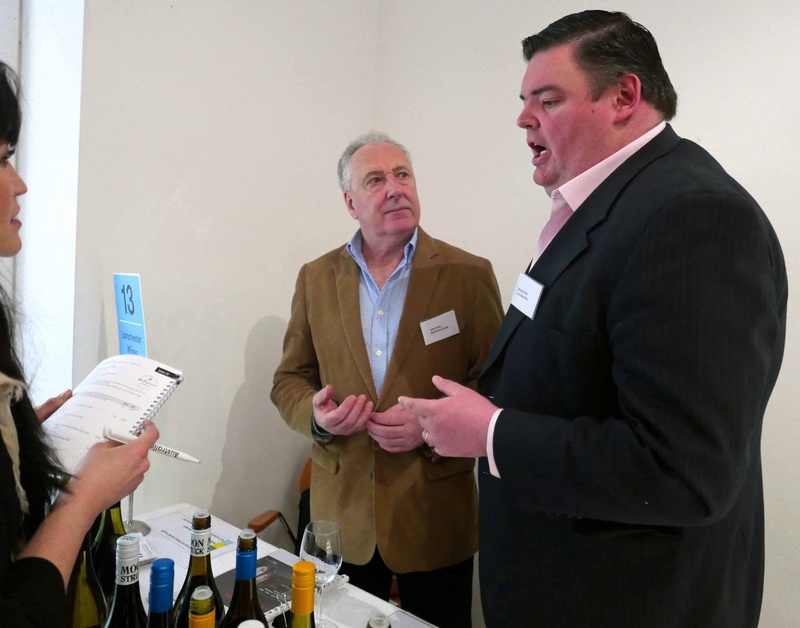 Many more wines were available in the London tasting for example and some Irish favourites, such as Cullen Wines from the Margaret River, Tim Adams from the Clare Valley, the Palmers of Skillogalee, gentleman Chris Pfeiffer of Rutherglen, the Brysons of Morambro Creek in Padthaway, were among those not present in Dublin for one reason or another.